European colonial authorities and settlers knew that the Aborigines could ‘read' the land like a book – that is, they could work out the route a person or animal had taken from studying its tracks. The settlers, somewhat reluctantly, recognised that this knowledge was invaluable in locating missing people and fugitives. Yet, it was often not until all other efforts had failed that they would agree to use Aboriginal trackers. 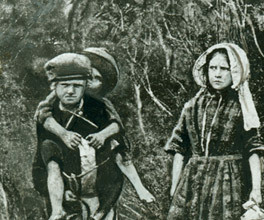 In a celebrated Victorian case in 1864, Aboriginal trackers were eventually brought in to look for the three Duff children who had gone missing in an arid and rugged area near their Horsham home. They had been missing for several days, and despite all hope being lost, were found alive nine days after their disappearance thanks to the trackers. When the Kelly Gang killed police troopers at Stringybark Creek in October 1878, Chief Commissioner Frederick Standish refused to use Aboriginal trackers to find them. However, after the gang's successful takeover of the town of Jerilderie, Standish was forced to accept help. In February 1879 a team of six Murris from Queensland were brought in to track the gang. The Queensland trackers [...] were very active on foot. On one occasion they had a very long trip to search for some place, and they were certainly then quicker than the local police, and in better condition. Royal Commission on the Police Force of Victoria, 1881, John Ferres, Government Printer, Melbourne, Vic. The 1881 Royal Commission was set up in part to find out how the Kelly Gang could have eluded the police for so long. These volunteer 'black trackers' were promised a cut of the £8000 reward for the Kelly Gang's capture. Despite the Murris contribution to the Kelly Gang's capture, they never received their promised portion of the reward money. Cases such as these led to Aboriginal trackers being used increasingly by the authorities. While they were often used as an absolute last resort, Aboriginal trackers played a major role in capturing many criminals who might otherwise have escaped in the rough country. John Batman's contract with the Wurundjeri people presents some inconsistencies.